Shows how The great Pyramid of Giza symbolically and by measurement corroborates the philosophy and prophetic times and seasons of the Divine Plan of the ages as contained in the Holy Scriptures. Charles T. Russell founder and first President of the Watch Tower and Tract Society once proclaimed that "God was the great architect" of the Pyramid built for the purpose of confirming the faith of his people at the end of the Gospel Age. In this voluminous work the authors John and Morton Edgar endeavor to show the handiwork of the Great Creator God in the construction and detail of this Monument as His Sign and Witness to the World. And in painstaking detail they most persuasively do show how The Great Pyramid of Giza symbolically and by measurement corroborates the philosophy and prophetic times and seasons of the Divine Plan of the Ages as contained in the Holy Scriptures. This work contains a host of photographs drawings maps and diagrams for the greater enlightenment and enjoyment of the reader. 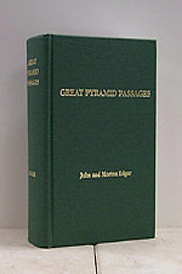 PS00600,great pyramid passages,john edgar,morton edgar,Great Pyramid Passages,John Edgar,Morton Edgar,great pyramid of giza,divine plan of the ages,who built the pyramids,symbolism,god's stone witness in the land of egypt,kingdom of israel,day of the lord,grand gallery,horizcontal passage,air channels,chronology,ptolemy,passage and chamber system of great pyramid,first ascending passage,symbolism of passages and chambers,rock fissures,city of bethlehem,solomon's temple,herod's temple,granite,kings chamber,queens chamber,plateau pyramids"